Have you stumbled across the funky, free Jam Labelizer yet? 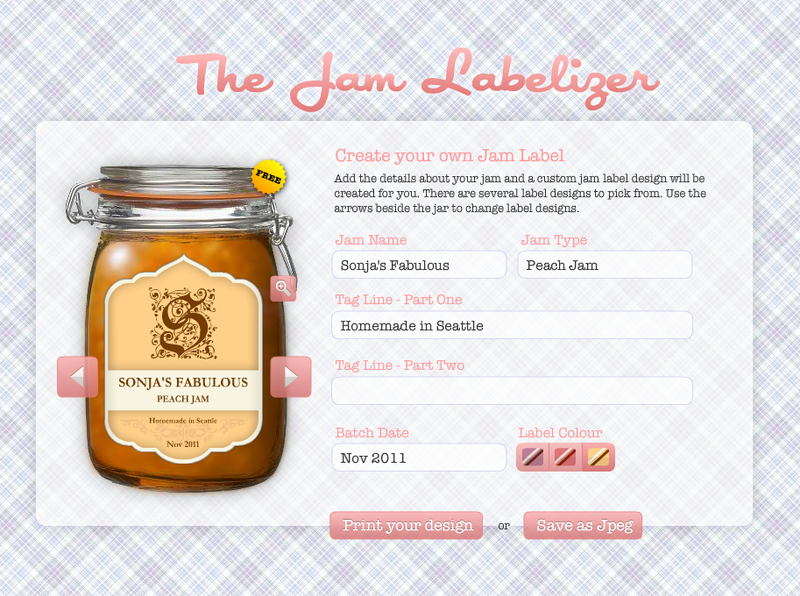 Type in your jam details and then save the pdf or print them out directly. Presto! Personalized jam/jelly/condiment labels! Homemade jam not your thing? Then be sure to check out the Beer Labelizer. omg, this would have been nice to know back in July, I had such a hard time finding labels! Will remember for this summer. Do you have a good intro to jam making that you'd recommend? I've never done it but have wanted to for a long time. They have lots of easy, basic recipes and then some other stuff (veggies, compotes, ect) if the canning bug really bites you. The only thing I'd add: buy the latest edition. unfortunately old canning books are probably best to avoid as our understanding of food science has changed quite a bit over the last 40 years. This isn't a big deal in most areas of cooking (and with jams you'd be just find, too) except that canning of some low-acidic vegetables needs to be done properly (with new methods) or it can harbor botulism. Which can kill you. :) So it's not a place to start experimenting. I really enjoy canning, especially stuff I've picked myself. The required tools (a big pot, lids, jars etc) are fairly inexpensive to acquire and the directions pretty easy to follow. Another decent place to get canning recipes: the little recipe books that come in most pectin packs. There aren't many ingredients that go into jam (fruit, sugar, pectin, sometimes lemon juice) so those recipes are simple but also taste like the real thing. Maybe start with those (as they're free when you buy pectin) and then buy the book if you enjoy it the first time. Have fun! It seems like something that would be right up your alley! Thanks! That book has been recommended a few times now so I'll have to look into it!